After Videofreex and Kit Galloway and before Gene Youngblood I’ll be Randall Packer‘s third guest in the Networked Conversations series. To participate you should go to the Third Space Network. Networked Conversations is a series of live, online interviews and discussions hosted by Randall Packer. The series features media artists, curators, writers, and activists exploring a broad range of social, political and aesthetic topics at the intersection of net culture. Networked Conversations collapses geographical and cultural boundaries via participatory Internet chat: free & open & accessible from anywhere in the world. Marc Garrett interviewed me for the Choose Your Muse series on Furtherfield. And he made this image to go with it, Thanks Marc! Other interviews in this series so far : Mike Stubbs, Igor Stromajer, Jeremy Bailley and Lynn Hershman Leeson. 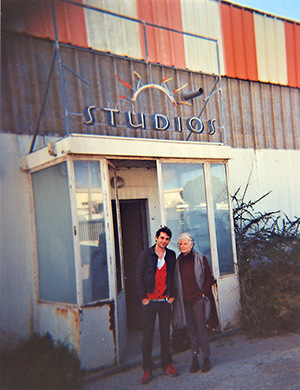 Photo in January 2013 with David Lavaysse in front of the recording studio of Montpellier’s local alternatif radio station Eko des Garrigues where we had just done an interview on his 1 min sound piece Réconfort infini (Eternal reassuring) based on one of my performance works. One year later David made a 7 days version with daily variation of the original piece that you can now download from his 1fusé website. On this occasion he also published a very short interview with me. Scroll the page to see all the versions including 10 numbered audio tapes with a handmade woodburned cherry artwork and a video. Ici pour la version française. Igor Štromajer & Annie Abrahams by Gretta Louw in BOMB Magazine April 21st 2014. BOMB Magazine has been publishing conversations between artists of all disciplines since 1981. BOMB’s founders—New York City based artists and writers—created BOMB because they saw a disparity between the way artists talked about their work among themselves and the way critics described it. “I first met Igor Štromajer online—we are net-based artists, after all. That was back in 2011 when I spent 10 days locked in a Berlin gallery, available 24 hours a day for contact via the Internet to test the effects of extreme online connectedness as part of a performance called Controlling_Connectivity. Igor became very involved in the performance, posing some of the most insightful questions from participants in the piece, and eventually dubbing me the “Joan of Arc of the Internet.” Through Igor, I discovered Annie Abrahams’s wonderful, groundbreaking networked performances such as The Big Kiss, where she spent several hours “kissing” a collaborator via the web using a split-screen and close-up webcam streams of each of the performers’ mouths. Though very different in style, these two artists share a gift for showing us the messy, human side of the Internet and technology; their work is authentic, intimate, exploratory, and inspiring.” Introduction by Gretta. Entretien de Emmanuel Guez et Annie Abrahams par Annick Rivoire pour poptronics. On pourrait croire (à tort), que le “Reading Club” est un mélange de “Fight Club” et de “Bookfighting”. Sauf que l’activité du “Reading Club” est avant tout la lecture, mais une lecture active, en réseau, participative, collaborative et performative. Annick Rivoire interviews Annie Abrahams and Emmanuel Guez about their recent project the “Reading Club“. The project, which experiments with an active, participatory, collaborative and performative reading on the Internet, chose Furtherfield as a host for its 4th online session. The following interview provides an interesting introduction to the ideas behind it. INFRA : Infra est une revue d’entretiens à caractère biographique, qui semble faire série de ce qui ne peut faire série  : des femmes.L’objectif de cette revue est d’entendre des femmes sans préméditer leurs paroles ni contraindre à un mode de discours, tout en proposant un temps et une forme où viennent se déposer mots, vies et désirs. Interview with Annie Abrahams by Alessandro Ludovico page 40 – 42.